A destination wedding is a beautiful and unique way to say 'I do!' 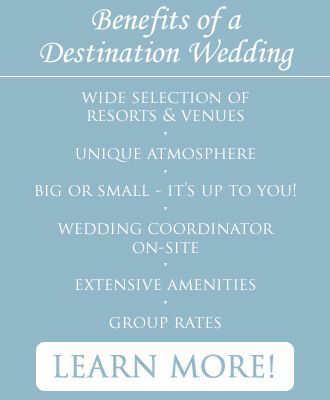 Making this decision is an exciting part of planning your wedding and honeymoon! Time and again, we hear from our couples that having a destination wedding was an absolute dream come true for them. It is because of this joy that our team of travel agents at 4DiscountTravel finds it an absolute honor and privilege to combine their expertise in traveling, arrangement resources and extensive destination knowledge to help with the planning of your beautiful day! 4DiscountTravel's mission is to ensure you and your soon-to-be spouse choose the wedding and honeymoon that aligns your vision and your budget with all of your details in between. Therefore, we hope you will read over some of the key points that we commonly cover with our couples and consider if a destination wedding is right for you. We look forward to working with you to create the wedding of your dreams!